(Notes on) Politics, Theory & Photography: Fostering Spaces for Creativity. Among the things I think about regularly, especially in connection with the decayed city of Rochester, is how to foster spaces for creativity. I have posted on the topic a couple of times  . I am less interested in what Rebecca Solnit refers to as places of presentation (galleries, museums, concert halls, 'fests' of this or that sort) than in sites of creativity. Institutions of the former sort are central to the relatively non-democratic plans for 'revitalizing' our city and I hold little hope that they will have the desired effects. Such institutions seem to me to largely amount to welfare for tourists and suburbanites who have little investment in the city. My current ruminations on this theme have been spurred by two things. The first is this story ("Reclaiming New York for Local Arts") from WireTap magazine that my friend Susan Orr brought to my attention. 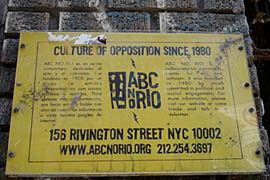 The story relates the history of ABC No Rio, an organization that sprang up and flourished in a once abandoned building in lower Manhattan that was appropriated by artists and that still provides a forum for creative engagement with the local (and not so local) community. Given the rush to gentrify the downtown sections of Rochester, it seems to me that this story provides a useful reminder of how things might go differently. The second impetus to my thoughts has been a series of articles by Rebecca Solnit    on neighborhoods in New Orleans and Detroit that are struggling to bootstrap themselves out from decay and devastation. Rochester is not as badly off as either of those cities (although given its rates of poverty and crime, the sharp patterns of segregation by race and class between city and suburbs, the flight of decent jobs, etc., it is not far behind). In the essay on Detroit she suggests that it is a city that will never ever be what it once was and that it must rebuild itself along some other vision. I think the same is true of Rochester, only no one has quite said so out loud. Arun Gandhi and "the Jews"